FordPowerShop.com offers Ford Racing Parts to Ford car enthusiasts, truck nuts and weekend warriors. There are many benefits to purchasing Ford crate motors. Ford Racing built motors are high performance performers and a great choice if you don't want to build your own engine or you just want dependability. Plus, most Ford Racing engines carry a reliable warranty of 12 months or 12,000 miles. Warranties are subject to change so please review the warranty details for the motor that you want. Ford Racing offers anything from a basic crate SBF 302, to a high-tech modular 4.6 Liter Cammer motor. Big block Ford motors pound out 580 horsepower and 600 lb* ft of torque. 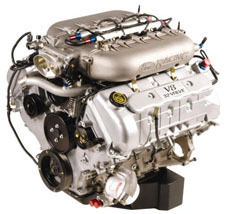 And, most of the Ford crate motors are available as short blocks, long blocks and complete Ford Racing crate engines. Download the Ford Crate Engine Overview PDF Here. Download the Ford Crate Engine Installation & Tuning Tips Here. Classic truck enthusiasts will like this website - Classic Truck Central. Classic Truck Central focuses on buying and selling classic trucks. If you would like to sell a classic Ford Truck (Before 1982), you may list it there for FREE. Please visit the web site: Classic Ford Trucks For Sale for more details.